A progressive coalition is launching a five-figure targeted ad campaign today against Democratic Rep. Tim Ryan of Ohio, Axios has learned. Why now: Rep. Ryan broke with the Democratic Party on Thursday when he announced his support for corporate tax cuts, which is a staple of the GOP tax reform plan. The TV and digital ad will run in Ryan's district for one week. Why this matters: Ryan is the first Democrat this coalition has launched an ad campaign against. They deployed a massive, seven-figure ad campaign against 8 Republicans in August. What they're saying: "Big corporations don't pay their fair share of taxes, but Rep. Ryan thinks they need even more tax cuts? That's absurd, and an affront to the voters of his district," said MoveOn.org Chief Communication Officer Nick Berning. "Instead of working to improve the lives of his constituents, he has chosen instead to fight for massive tax cuts for corporations," said Angel Padilla of the Indivisible Project. But Ryan thinks Dems can win 2018 with a business agenda. "To be competitive globally, we have to reduce the corporate tax rate," Ryan told The Hill. "We're just not competitive globally because of that. 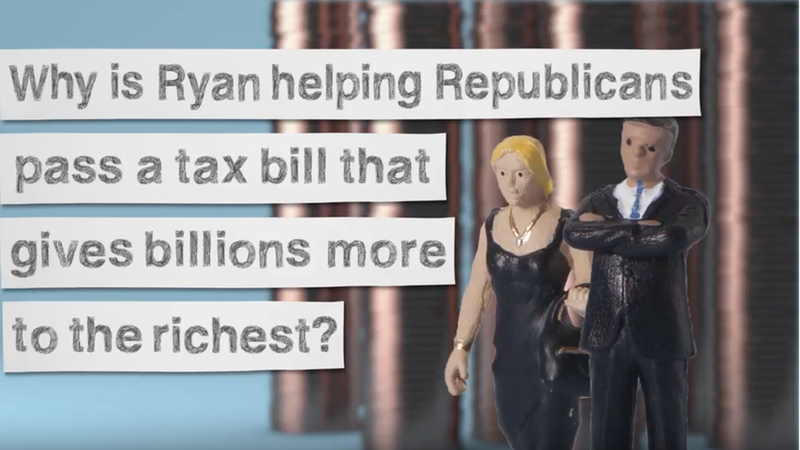 "Ryan doesn't support cuts for wealthy individuals, though, tweeting: "GOP thinks our problems can be solved by cutting taxes for the one %, & their wealth trickling down to the rest of America. It hasn't worked"What's next: "Not One Penny will hold Members of Congress accountable who want to give tax breaks to millionaires, billionaires, or wealthy corporations; Democrat or Republican," a spokesperson for the Not One Penny campaign said.Big picture: 78% of Americans are concerned that the wealthy do not pay their fair share in taxes, according to recent polling from Not One Penny. Ryan represents Ohio's 13th Congressional district, which has a population of roughly 710,000 and a median household income of just $42,019, according to census data. That socioeconomic stat reflects the criticism coming from these four groups and other Democrats who oppose the GOP tax reform plan, which they view as unfair to middle-class Americans and small businesses. "Instead of offering the American people a plan for real, job-creating tax reform, President Trump is pushing a billionaires-first, trickle-down tax scheme that hands out massive tax cuts to the wealthiest, at the expense of American families," said House Minority Leader Nancy Pelosi, who Ryan challenged for her seat just last year, but lost.